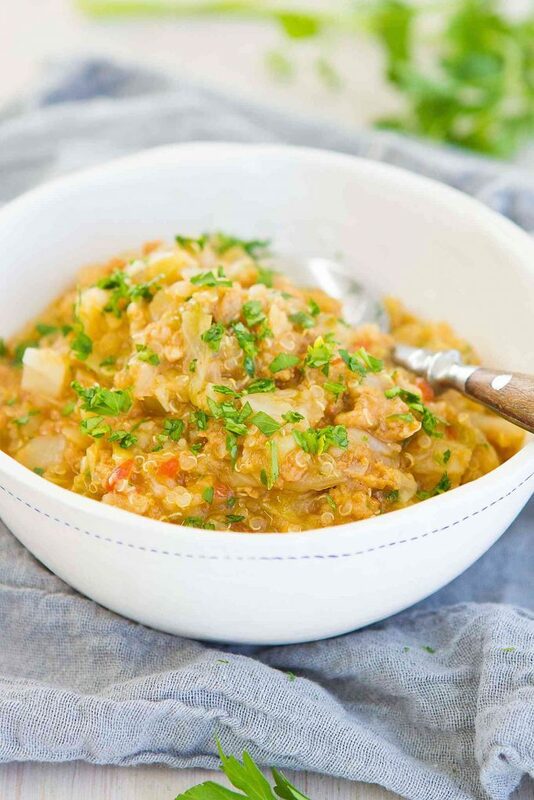 This Instant Pot Sausage Cabbage Bowl with Quinoa is a fantastic meal of healthy comfort food. And you just can’t beat the ease of a pressure cooker meal. I never thought I’d say this, but I am on a cabbage kick lately. To be more precise my pre-30-something self would be floored that I said that. But I’d like to think that the old adage, “With age comes wisdom” holds some truth. My new found love for the crunchy vegetable all started with my Thai Chicken Salad recipe, one of my all-time favorite meals. If you don’t have an Instant Pot, stovetop directions are included below. 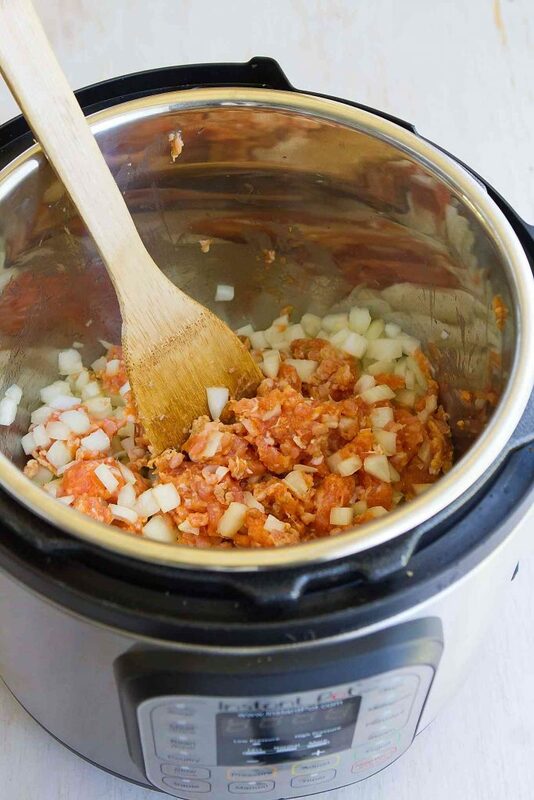 If you have fallen in culinary love with your Instant Pot (hand raised here! ), this is one to try. I regularly use my Instant Pot to cook vegetarian chili, curry and lentil soup, but this was the first time cooking quinoa in this handy pressure cooker. It took 3 minutes for the quinoa to reach a perfect level chewiness. Um, sold! While I used raw chicken sausage in this recipe, pork or turkey sausage can be substituted, with an adjustment to the nutritional information. 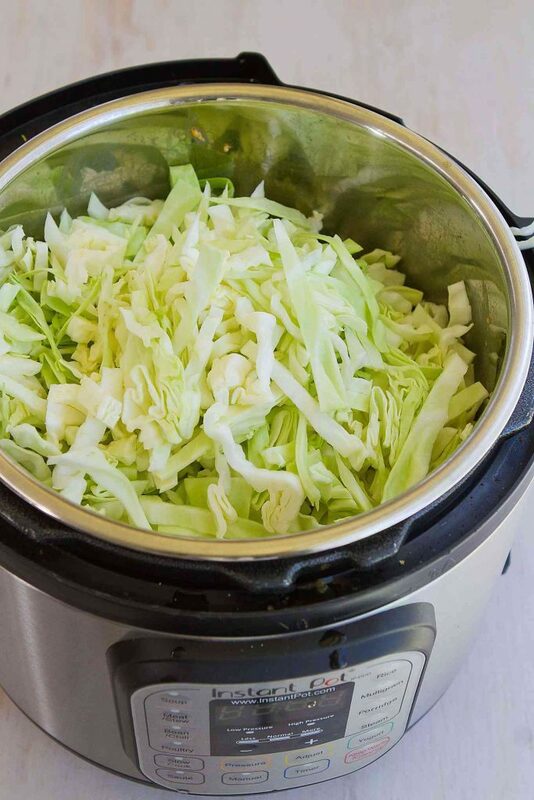 When cooked under high pressure in the Instant Pot, the sausage breaks down and incorporates almost seamlessly with the quinoa and cabbage. In the stovetop version, the sausage remains slightly chunkier, but tastes just as good! As for the cabbage, 12 cups may seem like a huge amount but just like spinach, it cooks down to a miniscule portion of that volume. If you’re feeding just a couple of people, note that this Instant Pot sausage cabbage bowl keeps well in the fridge for 1 to 2 days, making it perfect for leftover dinners and lunches. It will become even thicker as the quinoa absorbs all of the liquid. I prefer it this way, but feel free to add in extra chicken broth if you would like a soupier texture. Set Instant Pot to Saute setting. Add the olive oil and allow to heat for 30 seconds. Add the chicken sausage (squeezed out of casings) and onion, and cook, breaking up the sausage with a wooden spoon, until the sausage is browned, about 5 minutes. Stir in the garlic, paprika, oregano, salt and pepper. Add the chicken broth and diced tomatoes, and stir to combine. Once the time is expired, carefully use the quick release valve (it may sputter a bit) to release the steam. Stir in the quinoa and pile the cabbage on top (don’t stir it in). Put the lid on the Instant Pot again, close the steam vent and set to HIGH pressure. Decrease the time to 3 minutes. Release the steam using the quick release valve. Stir in the parsley and season to taste. Serve. Heat the olive oil in a large saucepan set over medium-high heat (if not nonstick, first lightly coat with cooking spray). Add the chicken sausage (squeezed out of casings) and onion, and cook, breaking up the sausage with a wooden spoon, until the sausage is browned, about 5 minutes. Stir in the garlic, paprika, oregano, salt and pepper, and cook for 30 seconds. Add the chicken broth, diced tomatoes and quinoa, and stir to combine. Bring to a boil, then cover and reduce heat to low. Cook until the quinoa is tender, 15 to 20 minutes. Stir in the cabbage and cook, stirring occasionally, until the cabbage is tender, 4 to 5 minutes. I’ve been putting off buying an Instant Pot but I really just need to do it so I can make meals like this! This looks so comforting and cozy, which is exactly what I’m wanting these days. While I’ve never used cabbage in a bowl like this before, I’m excited to check it out! I used to hate cabbage when I was a kid, but sausage and cabbage is one of my favorites now. Love that you added quinoa! I always enjoy the sausage-cabbage combo and the addition of quinoa is perfect – yum! I wish I had an INSTANT POT!!! I eat quinoa every day and love cabbage. I have an old PRESTO pressure cooker (4 quart), microwave (2), SLOW COOKER that I have NEVER used. I bought the big SLOW COOKER because I had a BIG FAMILY. Now there is just the 2 of us and it I think would be fun to have a new gadget. Or else I will have to substitute with my good old appliances, which my OLD BRAIN is used to doing. I guess it is a good mental workout, AGAIN! YOUR RECIPE LOOKS ABSOLUTELY DELICIOUS!! I love every part of this recipe ! 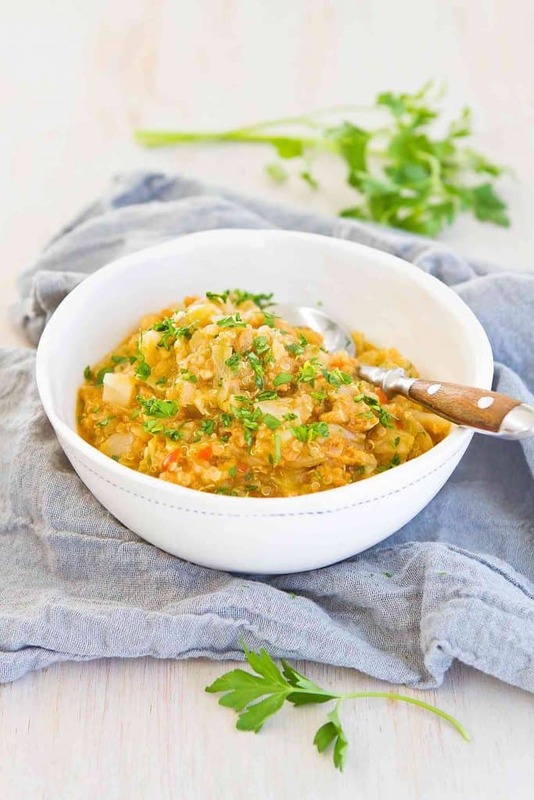 It’s so great that it can be made an instant pot for a quick and easy dinner … and despite being healthy and full of great ingredients, it’s still great comfort food for the whole family! Oooh yum! It looks a little like risotto, which I love!! My Instant Pot has very quickly become one of my go to accessories! We made this tonight and it was fantastic. We used red cabbage, and the only change was I threw in a diced jalapeno for some kick. Also, we had a ton of pre-cooked qunoa, so threw that in instead of dry quinoa. I was worried it would turn mushy, but it was perfect. Thanks for sharing! Great idea to throw in some jalapeno! I’m so glad you enjoyed it. this is a delicious cabbage meal,I love the use of Italian sausage in the recipe gives it that meaty taste.